So what have I been doing lately since I haven't really been drawing daily? Nothing earth shattering or exciting, unless you are really into watercolors, which I am at the moment. 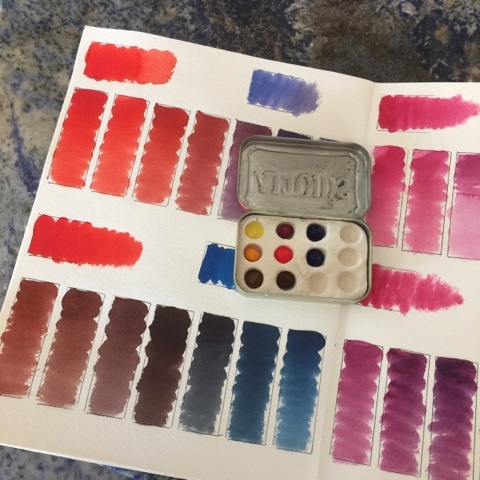 If you saw my post from yesterday, you know that Inktense blocks are my favorite art supply of 2015, especially in my Fauxbonichi which has Tomoe River paper. It was a tough choice because I'm loving watercolors these days. 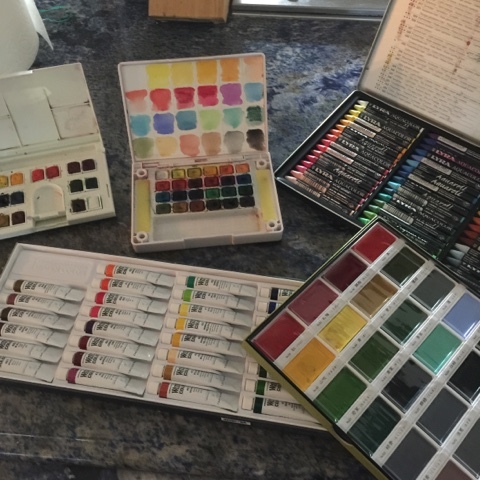 This post is not a comprehensive review of all the watercolor sets and products I have. I may do that later but for now, I'm trying to set up a compact set of 12 paints that I can take with me anywhere. There are lots of watercolor paints on the market from cheap to professional grade and I have quite a few! 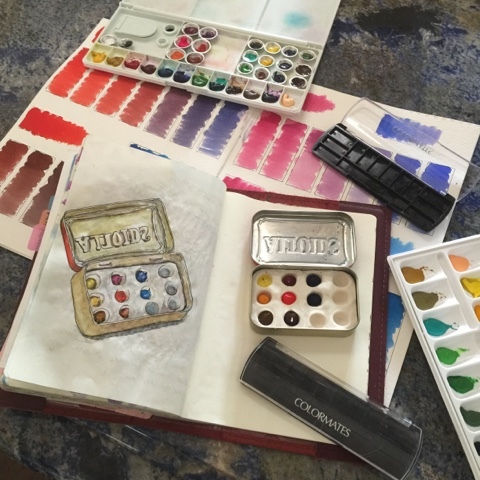 These are the inexpensive watercolors (Daler-Rowney Simply Watercolors found at Wal-Mart and Artist's Loft watercolor cakes found at Michaels). If you are just beginning in watercolors or if you just want some watercolors for occasional use, these are fine. There are others that are medium priced and better in quality. Starting with top left going clockwise. Except for the Lyra's, the rest are all under $35. I've not had a chance to use Lyra's much yet as it was a recent win from a giveaway (thank you, Felicia!). Others I have used quite a bit. Once again, I will do a review of these in future posts. And here are the professional tubes that I have. These are typically $10-$15 each for a 15 mL tube. 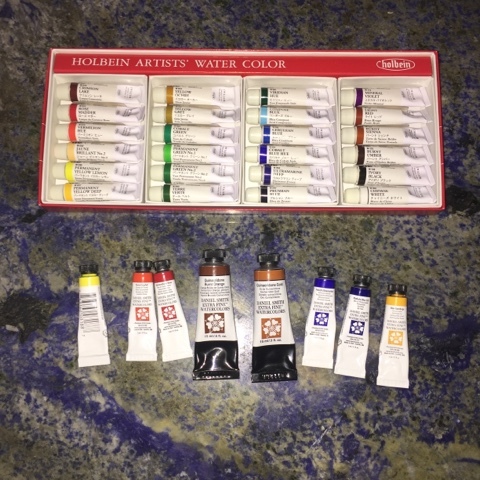 The boxed set of Holbein Artists' Watercolor set of 24 5-mL tubes are listed at Amazon for $43.36 (I got them about half as much recently on Black Friday). The 6, 5-mL Daniel Smith Extra Fine Introductory Watercolor tubes are listed at $27.76 on Amazon. I haven't really had a chance to use Holbein much but I definitely plan to. And I LOVE my Daniel Smith paints. 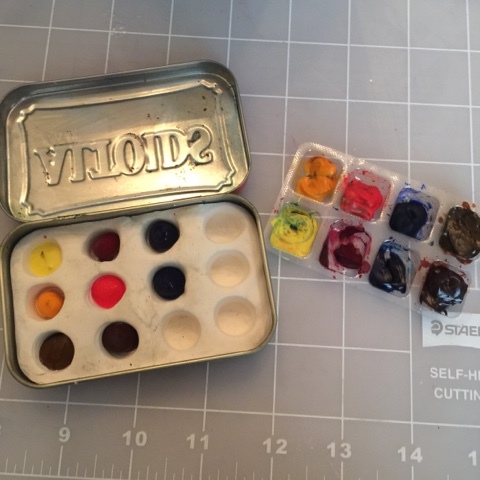 I created a travel palette using an Altoids mint tin and an empty gum tray and took it to my daughter's Battle of Gettysburg reenactment. With the primary set, I added quinacridone gold and quinacridone burnt orange to the mix because they help you make lots of neutrals. I'm happy with the 8 colors I have. But there are colors that I use often but have to mix them like greens, violets and burnt umber. So I'm looking to expand my palette to 12. I had some Sculpey clay (the kind you bake) so I created this palette using the end of a paint pen! Why 12? 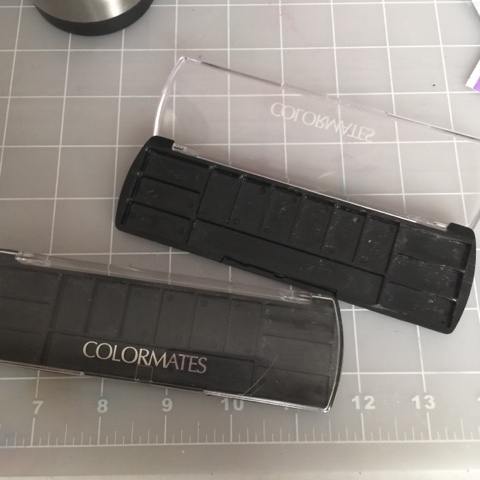 After reading so many articles about color mixing and properties of watercolors, 12 is a nice number to create most colors I would want to use without losing pigment saturation or carefully measuring components to mix. This is an excellent website about watercolors and color mixing. One of the things Handprint site suggests you do is to create mixing gradient so you can see the colors you can create by mixing various amounts of each color. And you see the saturation of each color created. Look at the variety of colors you create by mixing pyrrole scarlet and phthalo blue! I love the chocolate brown and teal! And see how saturated the colors are! Wow. However, there are certain mixes with Ultramarine blue that are very dull, like certain greens and purples. So I'm trying to determine what 4 colors I could add to my existing 8 that would complete my palette. 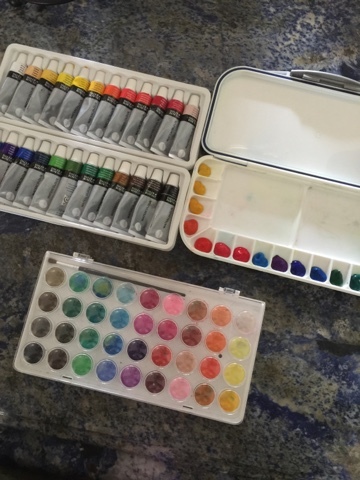 For my Holbein and Shinhan tubes, I bought these eyeshadow sets at the dollar store and popped the eye shadows out. I like this container as it has six larger wells on the side (for my warm and cool primaries) and 6 smaller wells for additional colors. Plus, it has a little are I can use for my water reservoir. I just have to pick the colors out of the sets I have. These watercolor sets are nice because you get to try a particular brand without having to spend a ton. The tubes are smaller (5mL instead of 15) and they come in lots of colors. However, I'm finding out that some of the colors included in the sets are totally useless or can be easily mixed given the right parent paints. And also, you can't rely on the paint names across brands to represent a certain color. So Daniel Smith burnt umber may be slightly different than Holbein's and etc. it's frustrating. I've learned that instead of color names, you have to look at the pigment identification. For example, cerulean blue in Holbein is PB35 but in Shinhan, it's PB15. And if you are interested in seeing what other artists' 12-color palette looks like, check out this page. This is a great blog to follow and he also has a YouTube channel worth checking out. So I will be testing my watercolors for awhile, mixing colors, creating my 12-color palettes and deciding which ones I really like. If you are an artist, please share your palette or your recommendation!